CLECKHEATON suffered a major blow to their hopes of avoiding the drop with a 43-41 defeat to already-relegated Consett last weekend. Indiscipline once again cost them in a high-scoring game, and they now face local rivals Morley tomorrow (Saturday, kick-off 3pm) in a crucial fixture. Both Bridlington and West Leeds also suffered defeats last week, although the two bonus points at least saw Cleck extend the gap to the relegation zone to six points with three games left to play. On their first-ever trip to Amethyst Park, on-lookers could be forgiven for confusing which side was already down and which side was fighting for survival, as the Spen Valley men trailed 7-0 within five minutes and 14-0 after less than 10. Cleckheaton eventually got a foothold inside the opposition 22 as the front row trio powered forward before Ben Thrower forced his way over the line for Cleckheaton’s first try. Consett’s Nick Cook extended his team’s lead to 17-5 with the first of five successful penalty kicks, after a Cleckheaton player tried to disrupt play from an offside position. Cleck responded midway through the half as a neat kick from Dale Breakwell found Danny Booth, who offloaded to Mike Swetman for a score in the corner. Cleck were briefly within seven points of Consett before a kick through from the home side found Henry Race quickest to react and he went in for his second try of the game. Cook, who came off the field with a 100 per cent kicking record, improved Consett’s lead to 24-10. The final act of the half was another gift of points courtesy of needless foul play from Cleckheaton. Consett accepted them gratefully to lead 27-10 at the break. Cleckheaton’s half-time team talk seemed to have effect and a penalty more or less at the kick-off allowed Breakwell to kick the ball to the corner. The line-out drill was solid, as was Ryan Piercy’s marshalling of the ball at the back of the maul, which allowed him to crash over a minute later. The conversion was good and Cleck had a lifeline at 27-17. A no-arm tackle from Jack Seddon reversed the Moorenders’ fortune, gifting Cook another three points before Booth latched onto a Breakwell kick for his 12th try of the season. Breakwell’s conversion narrowed the scores to 30-24. Moments later, quick hands down the right flank by Ollie Depledge put Mikey Hayward across in the corner for his 12th try of the campaign and when Breakwell added a towering kick from the touchline, Cleck had worked their way back into a slender lead. Consett were not done and were once again assisted by Cleckheaton’s indiscipline, which leaked another three points to put Consett back ahead, and their day looked to be done when the home team went in again to extend their lead to 40-31 with seven minutes to go. Coach Thiu Barnard moved Swetman to outside centre and it paid off when the big man had too much momentum to be stopped from crashing over the line. Breakwell added the conversion to put Cleckheaton within just two points of Consett and within minutes, when the penalty came, he kept his composure to hammer over a long-range goal. 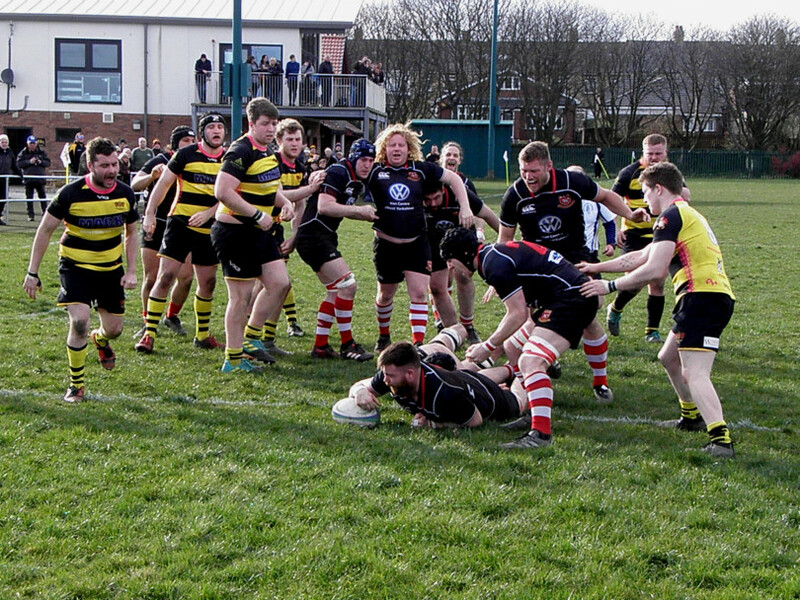 Cleckheaton had got into the lead at 41-40 with just 90 seconds left on the clock. All that remained was for Cleckheaton to secure the restart and run in three or four drives, and victory would be secured. It was not to be though, as the pack did not organise themselves in time for a short kick-off and Consett tapped the ball back. Thrower tried to wrestle a ball from a Consett player but ended up with his arms around the player’s head and the referee had little choice but to give Consett a penalty, which sailed over from 40 metres out to win the game.